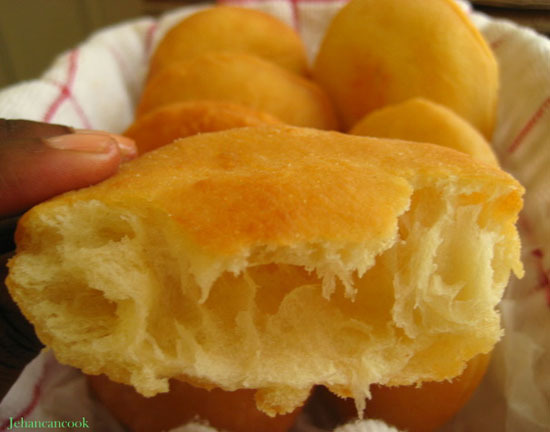 Bake is a popular breakfast item in Guyana. It requires very few ingredients and is very easy to whip up. There are many types of bake but this is my favorite. It puffs up when its cooked to form a pocket on the inside and is soft and chewy but crispy on the outside. Mix flour, baking powder, salt and sugar together in a bowl. With a fork, or using your hand(quick method) rub butter into flour mixture. Add water to make a firm dough, but not stiff. Dough should be easy to roll. Let dough sit, covered for at least half an hour. Roll dough to about 1/2 inch in thickness and cut with a biscuit cutter. Heat about 3 inches of oil on a medium fire. Fry dough until golden brown, flipping once. Best when served hot. Mmmmmm…. My mother used to make this with saltfish. Do you have a recipe for that too? How else do you serve your bake? I do have a recipe for saltfish…This can be served with corned beef for just by itself! You can look for the saltfish in the international or asian market, its called boneless bacaloa. I have posted Egg ball and cassava puffs also, you may be interested in those since u wanted a potato ball recipe. If you have problems finding cassava in Seattle look for yucca at the international or spanish stores, it can be found with the frozen vegetables. I’ll definitely look up the egg ball! I’m not a fan of cassava, so I’ll skip that one. Something about it just doesn’t work for me. Thanks again! I love this with cheese 🙂 and eggs. Wow Jehan you did a great job on those bakes. The first time I tried this bake was last year when I visited Trinidad and it was so good. I usually make the muffin type bake like an english muffin that u can slice open but I love this one too. Jehan, those are the prettiest bakes i’ve ever seen! Keep up the good work! wow! that is so simple! very similar to a kind of chinese bun. love it! thanks for sharing. thanks for sharing the recipe!!! thousand kisses for you!!! I used to have this when I was in Jungle Assault School in Guyana. It was the best bread I have ever had in my life! The military cook there used to serve it with carp fish spread. It sort of tasted like salted tuna with celery. I can still taste it. HI, WANT TO LET YOU KNOW THAT MY DAUGHTER TRIED YOUR RECIPIE FOR BAKE, AND ALSO THE SALTFISH RECIPIE. AND SHE WAS DELIGHTED, BECAUSE BOTH CAME OUT PERFECT. THE BAKES WERE LOVELY, SOFT AND FLUFFY. THE SALTFISH WAS ABSOLUTELY HEAVEN. SHE GAVE ME SOME TO TASTE, AND I STUFFED THE SALTFISH INTO THE BAKE AND REALLY, REALLY ENJOYED IT!! MY HUSBAND ENJOYED IT AS WELL! SHE FOLLOWED THE INTRUCTIONS FOR THE RECIPIE, AND THE ONLY THING, IS THAT SHE LESSENED THE SUGAR, ALSO THE BUTTER, SHE USED THE NON DAIRY MARG. AND SHE HAD TO USED MORE WATER TO GET THE DOUGH TOGETHER NICE AND SOFT. SHE ALSO FORM THEM INTO GOLF SIZE BALLS, AND ROLL THEM ALL OUT, AND FRIED THEM IN THE HOT OIL ONE AFTER THE OTHER, AS THEY SWELL UP QUICKLY AND GOT BROWN. THANK YOU FOR PUTTING SUCH ACCURATE AND DELICIOUS GUYANESE DISHES ON THIS SITE. LIKE TO SEE SOME MORE, AS SHE LIKES GUYANESE AND TRINIDADIAN DISHES. THANK YOU!!! Lord! Girl, I saw the picture of the bake and my mouth literally started to water! And I just had a scrumptious steak dinner this evening!! Bake is also good if you fill it with cheesy scramble eggs. My mom always made it with Stew Salt fish. But it’s good either way! Jehan, thank you for a wonderful blog and keep the recipes coming! Do you have a recipe for Cookup Rice? Thanks again!! these bakes are magic. I messed up but they still came out good, I had like only 1 tspn of butter so I used oil and milk and before that i lessen the flour after puttin the bakin powder. ThenI lessen everything else even the amount of frying oil was lessen but they still taste good amazing. Next time i make these i am goin to follow everything so they come out a 100 times better.Glad I found u you are amzing,keep puttin more recipes. Sill question I know but what flour do you use, Plain or Self raising? Sorry about that, but I used All purpose flour. Hello: Bake! Yummy. Gosh! I can’t wait to try it. I’ve been promising my fiance (he’s is Italian) that I would make this thing that looks and taste very much like the chalupa bread from Taco Bell for him one day. That day is here :). Now that I have the recipe for Bake; I am excited. PS. I have to say that I am a very good cook; from Italian, Chinese, Guyanese, Thai food, to Mexican but I don’t know how to make these special dishes (eg: Bake, Cheese Rolls & Pine Tart) to make them taste just like they did in Guyana. I was waiting for someone to post these on the internet. Thank you. Hi Mary, I like my bake airy with a pocket in the middle to place my salt fish. If you prefer a more dense bake, reduce the amount of baking powder or don’t allow the dough to sit for too long, I hope that helps. Thank you for the kind comments and keep visiting. Beautiful website, thank you very much. I will definitely purchased the book mentioned on the patty section. One question, is there a difference in using whole wheat pasty flour and all purpose white flour. I find that white flour bloats me up, so I try not to use it or limit my use of it. In fact I now only cook with whole wheat four either pasty kind or regular. Since this is a pastry, would you recommend ice cold water. (I remember reading about using ice cold water especially when making johnny cakes – this is similar). Thank you for posting this recipe for bakes. My kids love it and my memories of childhood came back..
Jehan, I made bake today. It was delicious. I halved the recipe because it only me here. I did not succeed. 🙂 My bake turned out very dense with no hollow middle. I did not have a rolling pin…i rolled it between my palms. Lol! Even though it was not hollow, it was delicious (tasted just like the bake i remember as a child in Guyana) and I will definitely make it again. Thanks for posting. I have added your site to my favorites bar. Hi Malisa. Try letting the bake sit longer and see if that will help. Made your bake a while back and was a hit with my guests here in Canada. They taste almost the same like my mom’s bakes, only hers are a touch sweeter. I have been craving “bread-y” types of food lately and have been searching the internet hi and lo for a decent Guyanese BUTTERFLAP recipe. Do you have one that you use that you can post or email me? I would be EVERRR so grateful! Hi Radha, I don’t currently have a butterflap recipe but will be doing some research on a good recipe, so hopefully I can post about it sometime in the near future. Hi I like your recipe for floats, where i work we bake for the wards. It would a great change for them.. Thanks for the recipe I have used it i my workplace and everyone enjoyed it.. thanks..
Hi Reshy, if you chose to use self rising flour use 1/2 all purpose flour and 1/2 self rising. I wouldn’t recommend using just self rising flour and I don’t like the outcome or taste. I absolutely love your blog, I made the potato & chicken curry, with roti and it came out great!! Question about the bake, What type of oil do you use to fry it in? Hi Niq, I’m glad you enjoyed it. I used canola oil to fry the bakes. How many calories are in bake? Peaches I don’t know how many calories are in bake but since its fried I’m sure it’s a whole lot lol. Do you sift the flour before measuring for this recipe? Thanks. Jehan: How many bakes did you get from this recipe? Please let me know. Thanks. Just made the bakes. They were delicious. I had to decrease the water to 3/4 cup. I don’t know if it is because I used 2% milk instead of water. Does the use of milk differ from water except for the nutritional benefit? Thanks. Have you ever tried baking them? Please let me know. Just a fat issue for me. Angela, I don’t sift the flour. Using milk should not affect the amount of liquid. The less liquid you use the stiffer the bake will be. The amount of bakes this recipe makes varies based on the size of bake. I use a biscuit cutter and make about 1 dozen bakes from this recipe. As for baking them, I have not and probably won’t as I think that will chance the taste and texture tremendously. I hope I’ve answered all of your questions and thank you for visiting. Thanks. The next time I will not sift the flour. That is probably why I had to use less liquid because there is a difference between measured sifted flour and flour that is not sifted. Mine did not look like yours, maybe next time but they were delicious. Seeing that I will be using some of your recipes, please clarify, should I not sift the flour for your recipes and when you use spoon measure, do you mean level spoons or rounded? Thanks again. Beautiful site. I tired this this morning…omg what a disaster! I’m new at baking, understanding dough etc. the dough was sticky and impossible to work with! After reading the comments, I think bc my flour says pre-sifted and I used the full cup of water it just never got the right consistency. I think a few more pics of the dough and how you should roll it out and the size would be helpful! I did try frying it anyway and I loved the taste, reminds me of my grandma’s! So I hope to give it a try again! Jade, this is a soft dough but it shouldn’t be too sticky to handle. As mentioned, do not sift the flour. Let me know what your results are like the second time. I forgot to let my dough sit for 30 mins so i didnt get the hollow i was looking for to stuff my ackee and salt fish in! but it was awesome anyway, next time will def let it sit. I just had to leave a comment. I just finished making these bakes with my 1 1/2 year old daughter. It was just great. Her role was to flatten the rolls as I didn’t have a cookie cutter available. Aside from that, the bakes came out great. I’ve tried many other bake recipes and yours came out the best. I’ll be visiting often and I plan to try out some pastries next. Thanks alot! Jehan, you is ah boss girl!!! When ya go put up some Youtube videos? Before or after de book? We waiting! I’m glad that you enjoyed it. I hope that turns out well also and thanks for supporting! Islander I’ve been playing with the idea of doing videos but I must say I’m a bit camera shy. I am a Guyanese married to an Aussie and living between Belgium, US and Australia. So delighted to fall upon your site….Do you think that your saltfish and bakes could work for a cocktail party we are having in December? Hi Paula, thanks for stopping by. I think bake and saltfish would be absolutely perfect. I would simply make the bakes smaller, about the size of a dinner roll or even smaller so it would be 2 or 3 bite sized. Thanks for the response. In the meantime we did a trial run…but our bakes did not rise….where could I have gone wrong? Hi Paula, maybe the baking powder wasn’t good. Toss it out and try again with new baking powder. Can I use self rising flour instead of all purpose flour and baking powder? You can but I wouldn’t recommend it because I find that it tastes better this way. OH MY GOODNESS! I just made these bakes and they came out SUPER. Thank you for posting. Now I am hunting for a roti recipe and hoping you have one posted. Thanks again. Bajan here, had these in Dominica years ago. These came out so gooood! I found thought that the ones I rolled out thinner and put in oil that was hotter rose more. Hi …Quick question what’s the average amount of float bake does this recipe makes? Naz it depends on the size of the bake. I use a bisuit cutter and I get about 12 bakes. i love float bakes and make them formy husband all the time. I like to add some freshly grated nutmeg and cinnamon, as well as a wee bit of essence in the water while mixing. Joy that sounds amazing, my mom would add different spices from time to time also. Hi Teri i don’t have a recipe using yeast. Your site has become my go to place for recipes. My daughter who is 3 loves these bakes and we all know 3 year olds have some interesting ideas about food. I reduced the sugar a bit but otherwise perfect every time. I always wondered why my aunt use to mix her bake dough hours ahead, Thank you. Made these for the first time today & they came out pro! My dad was rather surprised lol , good recipe . Thanks Mya, I’m glad that you and your dad enjoyed it. I just made bake (I’m Guyanese), and it came out exactly how I like it! I’ve made it a few times before, but this is the best that it’s come out. Tastes similar to how my grandma makes it. So glad I found your website. Keep up the good work! Thanks CA, glad you like it. I love your website! I am Guyanese, but my hubby is American. I rarely cook Guyanese foods, but was inspired to do so after a visit back home. He loved the bakes! Thank you! Made these baby today, had them with ackee and salt fish……GOOD. Thanks girl. Jeahan girl this bake recipie is the best of all time. I tried learning for my mother but she only telling me to put a lil bit if this and a lil bit of that. I couldn’t learn that way. Thanks to you and your explicit instructions I have been making consitently goods bakes. Cant wait to try some more of your recipies. I am a Trini who used to live in Brooklyn and now lives in Philly. I just stumbled upon the blog and love it! Can’t wait to try some recipes. Can you make doubles? If anyone has trouble with the rising of these, a technique I learned from my sister was to spoon hot oil into the center of the float while it’s frying. Makes a big difference. Great recipe! Mamata, I do this technique also, thanks for sharing. I have yet to try doubles, but it’s definitely on my list of recipes to try since I love doubles! Do you have a recipe for Chinese cake? Please post if you do. Pam I do not have a recipe for Chinese cake. Tricia, I’ve never tried other flours. Thanks for the tip. I am 100% Guyanese and these bakes are 100% delicious !!!!! My husband always says to double the recipe. Wow Jehan, I tried your bake recipe this morning and it was WOW FANTASTIC DELICIOUS so soft an spongy! Thank you so much…. Keep up the great work….. I add some pepper sauce,ground garlic and grate yucca aka cassava in my flour mixture as well….. I’m so bad when it comes to baking power, but your site has make me a professional now lol…. Thank you once again for all the delicious recipes ! 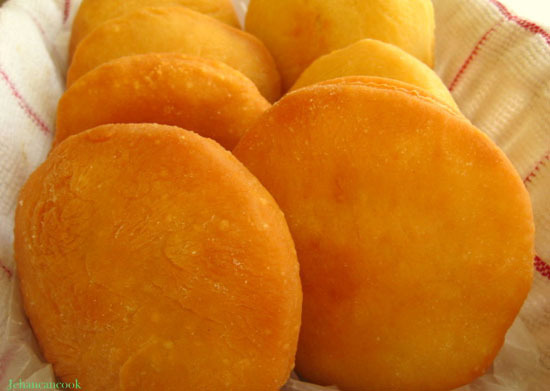 do you have the recipe for doubles (Trini)? Dameon, thank you so much! I don’t have a recipe as yet but I am working on one! Stay tuned. what should it look like before we flip it? This look delish and easy to make. I saw a lot of commentors say they like saltfish and I have a good Ackee and Saltfish recipe over here http://caribbeanfood.com/recipes/jamaican-ackee-and-saltfish that I hope you’ll give a try. mine didnt come out right. As soon as it hit the oil i new sonething was wrong. The ones that didn’t disintegrate with oily. I think the dough was to lose like cake batter. And should have been more like biscuits batter correct? These bakes are so delicious! I made these for the first time today as my family loves any and all breads! Definitely will be fixing them for breakfast and stuffing them everyone’s favorite breakfast. I’m gonna make these and stuff them with tilapia, it’s the only fish we eat. With a side dish of coleslaw. Thank you so much for this awesome recipe! It shouldn’t be like that. The measurements must be off…please double check next time. The dough should be soft but not like cake batter. Hello , I am Brazilian and I did not understand what yeast you use, whether it is the yeast or leaven for bread. I’m dying to do here in Brazil . I live in the Coast Praia Grande and Santos downloaded here has many fish . Tatiana yeast is a type of leaven that is used for making bread. It is usually sold as rapid yeast or just simply yeast. I have no idea what it would be sold as in Brazil so I can’t help you with that part. I hope this helps. Is it bad if I used warm water for my bake?! Julie it’s best to use room temperature water. The recipe produced the best bakes I have ever made. Thanks. Amanda thank you for the feedback! How do you make the name less doughy and less dough like this picture you have up? I made the bakes over and over and its great but not airy inside like yours in the pic. Ahviee, make sure the oil is very hot and the bake need to be rolled thin…about 1/2 inch in thickness. The hot oil will cause it to expand almost immediately at it comes in contact with the dough. I made Bake this morning as a surprise for my wife. This is our first New Year as married couple. I wish I had saw your recipe first, your pictured bake got me. So next weekend guess who’s recipe I’m going to try? Yours definitely. So I will come back on your site and tell you how it turned out good or bad. I know from the look of of your picture bake that if it doesn’t turn out it’s because I did something wrong. Thank you for sharing your wonderful recipe. Happy New Year! Thanks Latrina and good luck!